I decided to do this one early in the game because I will probably say this over and over again in the months to come: your eyebrows are the most important feature on your face. 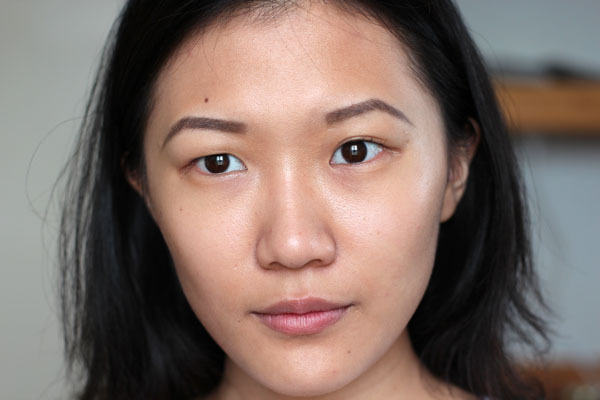 If you only have five minutes in the morning and you can only do one feature, I say do your eyebrows (unless you already have naturally perfect eyebrows, then I pat you on the back and congratulate you for your fortune). 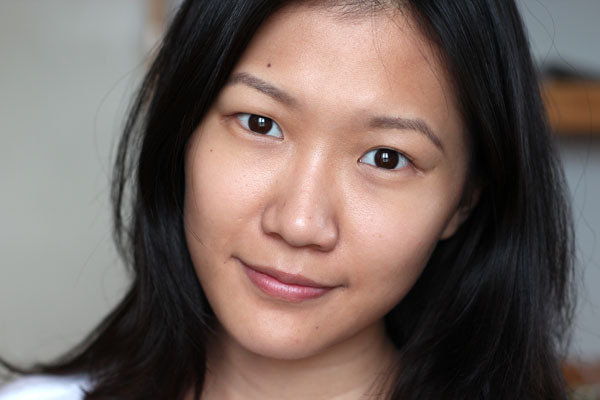 Much like how I lack a nose bridge, I grew up without eyebrows. 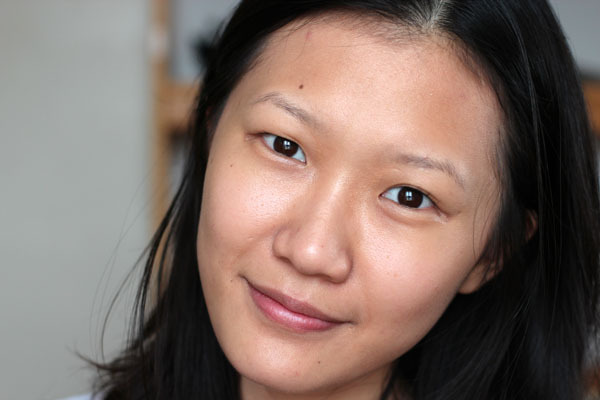 I remember my first facial appointment where the aesthetician asked if I wanted my eyebrows tweezed. I didn't know what "tweeze" meant, but my mother was in the vicinity and she told her no, because I already had so little. 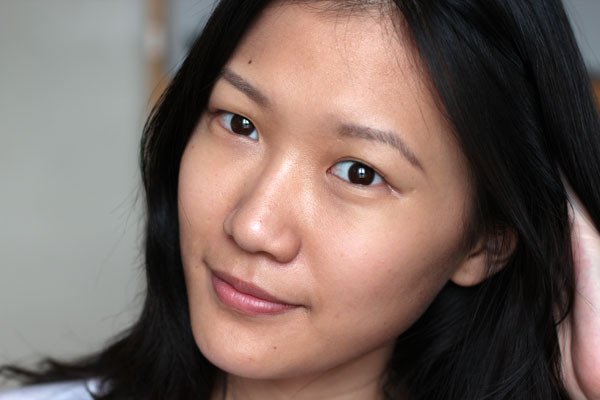 With their penchants to over-tweeze, what if my brows disappeared entirely? I do not exaggerate when I say it took me over two years to be satisfied with how I drew my eyebrows. 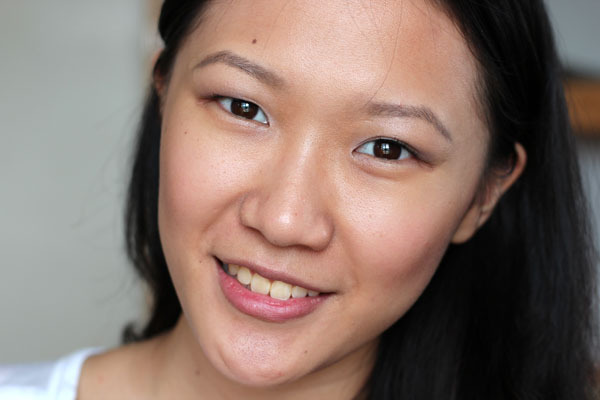 When I first started, I didn't own an eyebrow pencil, so I used a brown eyeliner thinking it should work the same. I followed the natural shape of my eyebrows (keep in mind, they weren't tweezed as they are now) and smudged it a little. It looked like two dark, bent lines - no arch, no definition. I still cringe at the memory. Needless to say, no photos of that era survived. Throughout the years I've met people who mercifully set my eyebrows straight. 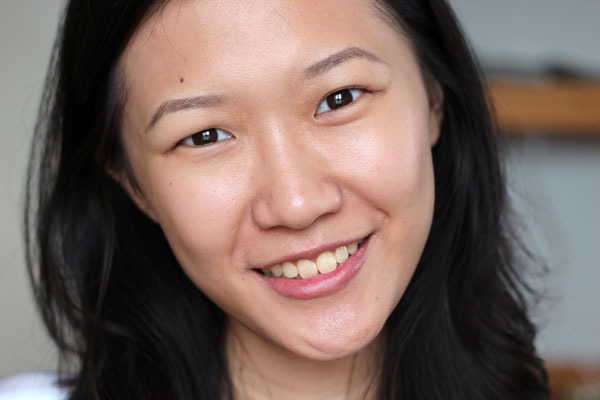 A friend in an a capella group, a sales assistant at a Shu Uemura counter, a Benefit brow consultant, countless hours scrutinizing images of models and staring at people on the street sporting perfect brows. I remember one non-fiction writing class where the bulk of my semester was spent wondering if the girl sitting across from me filled in her brows, because they looked so full and defined to perfection. Now that I am comfortable with my brows, it's time to give back. 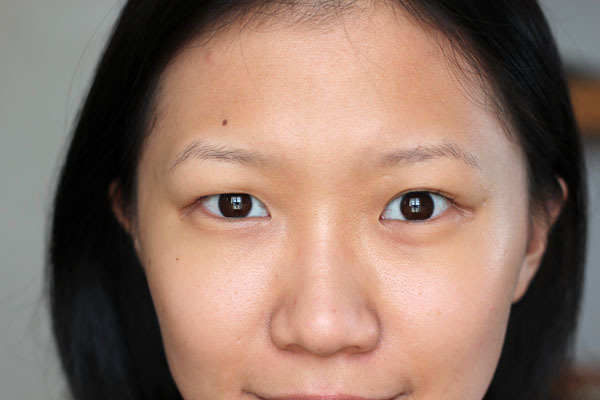 I hope this tutorial proves to be of help to any lost eyebrow soul (like I once was) out there. You can choose a variety of products to shade in your brows. In my experience, I draw my brows the quickest when using a brow pencil, but it imparts a darker line that could end up looking unnatural. 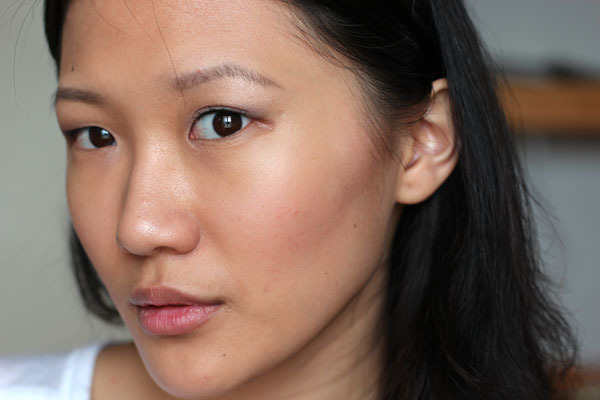 Using eye shadow might take up more time, but the finish far better mimics a natural brow. For this tutorial, I will be using the latter. 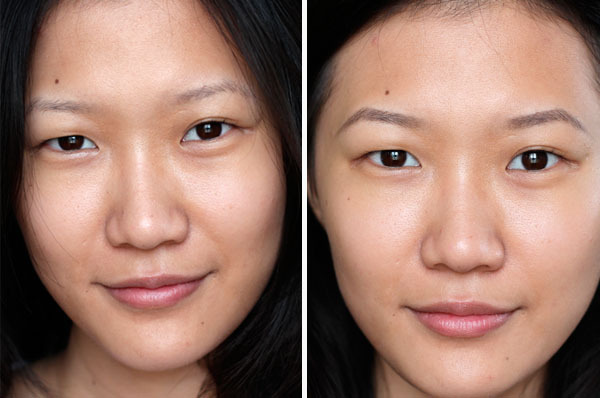 Tip: when choosing a brow shade, make sure it is at least one shade lighter than your hair. This next tip is courtesy of Joey at the Armani counter of Bloomingdale's 59th/Lexington. Lay the brush flat when picking up the color like so, and do it on both sides of the brush. That way you'll be able to maintain the shape of your brush and keep it from splaying. 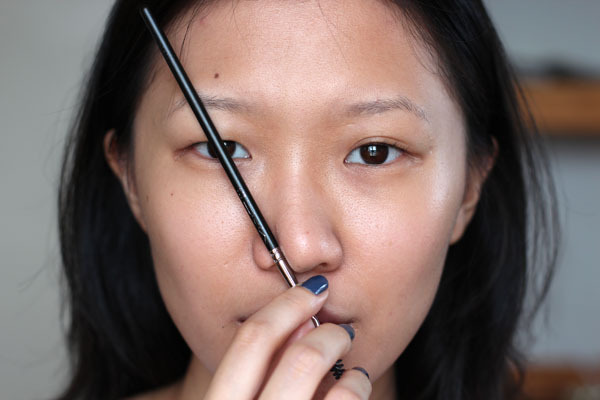 Once you get the color, shade your brows in using the method below! You can always refer to it along the way to make sure you're on track. 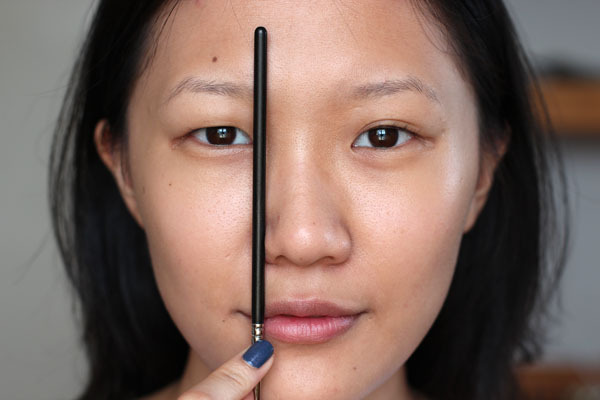 To find out where your eyebrows are supposed to begin, position a stick (I used my spoolie in these pictures) by your nose and align it to the inner corner of your eye. For the arch, position it like below, and align it to the center of your eye. To find out where it ends, place the stick once again by your nose and align it to the outer corner of your eye. After you're done shading, use the spoolie to gently comb through the hairs. Remember to follow the natural direction your hairs grow in (generally, upward at the front, downward along the tail). I definitely look brighter and much less disheveled on the right. Always use a spoolie after. Thanks for this tutorial. I too had a shu artist at Barney's teach me how to do mine as I have even less than you do and what I do have is old lady white. 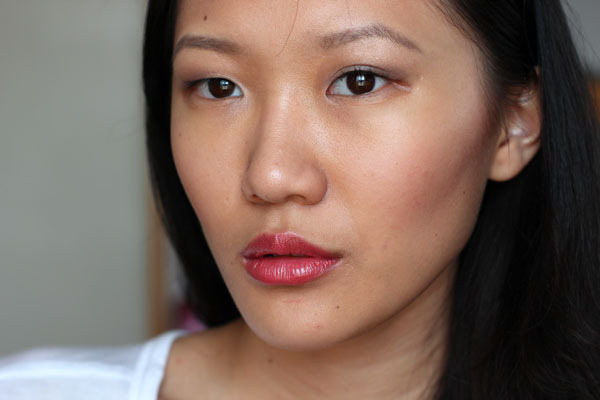 The NARS shadow looks really pretty on your cheeks! Gotta love a multi-tasker. Love the tutorial, and great tips! Wow, what a difference those lips make in the last shot! Fab colors! You look absolutely stunning in the last picture! Thank you so much for sharing your tips! You make it all seem like a piece of cake! What a great tutorial! 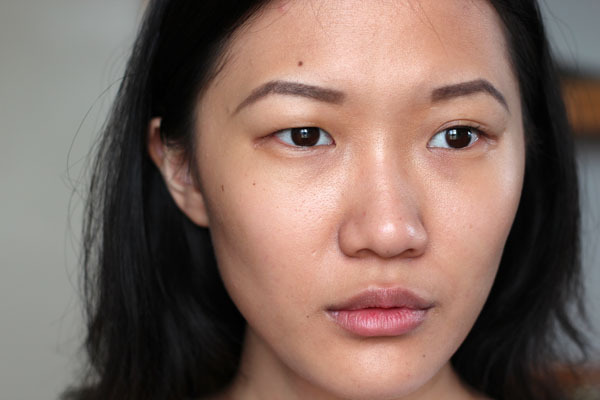 I have sparse brows so I have trouble getting my brows to be just the right density; I don't think I've found the perfect routine yet, but I'm inspired again after reading this post. 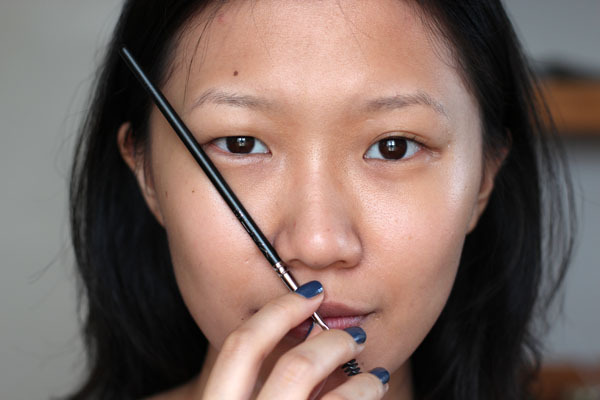 Have you ever tried a pencil brow liner instead? Or do you find shadow to be better in general? What great tips! I love the step by step photos and comparison shots, too. I also love the lip color! 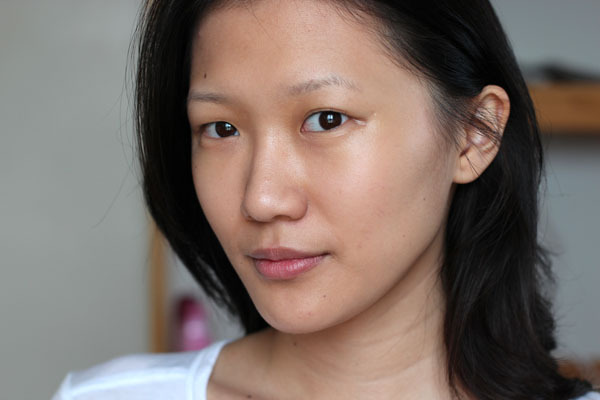 @MickiD Shu artists are the best :) They're the only ones who tweeze my brows right. I was pleasantly surprised with the rose too! @Material Girl Thank you <3 Haha girl, two years of hard practice! @Zuzu's Petals Thank you :) I'm OBSESSED over brows now. @Dovey Thank you! I've tried pencils and they're usually darker so it's harder to get them to look natural for me (the spoolie helps). Joey, the makeup artist from the Armani counter, told me that using shadow is better because it's softer and better melds to your skin. I save using pencils for when I travel since they're easier to bring around. I always get a kick out of the posts where you post good/bad images of the way makeup can be done. I must admit that eyebrows are a real pet peeve of mine: when I see girls who have done them in a non-flattering way it's ALL I see! I remember having a class with a light brown haired girl who filled her brows in BLACK (think the Amy Winehouse liner version of eyebrows) ... it was all I could look at. I've always had sparse brows my whole life. It wasn't till my 10th grade year in high school that I discovered those Maybelline liners that you're supposed to use for your brows and as eyeliners - the red pencils? The problem - I used the black pencil! Not a good idea. I discovered MAC espresso shadow and the #266 brush in my early 20's. I am now 36 and I have never been separated from my espresso shadow and #266 ever since! This was a great post and you are a girl after my own heart! I do my brows just to go to the gym on the weekends. You would probably benefit from not drawing on the arch so exaggerated. The part that is going down is going down too low. It needs to be softer and more rounded. I've never heard of this method for drawing brows so thank you so much for this tutorial! I like the idea of using the angles of your nose because it seems easier to replicate the same result every day. 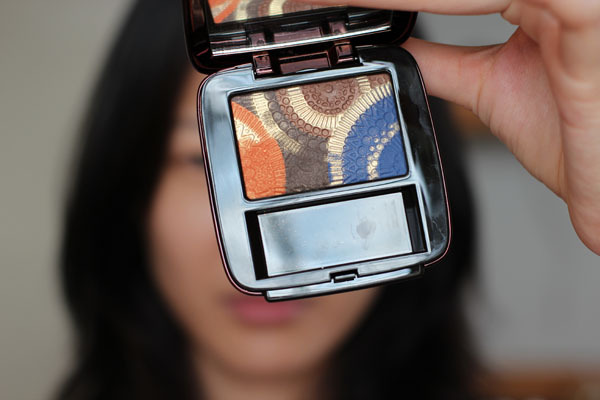 hey, in case u want to try a different regime, i recently found the perfect mac eyeshadow colour for asian brows. Since all of the ones that people tend to use (charcoal brown, brun) look a bit too red/orange with black hair. i went to a mac counter and look for the most ashiest brown colour i can, and i found coquette. i use it with chanel brow brush (no 12), which looks like any angled eyeliner brush, but the bristles are much sturdier and rougher, so its really good for filling out eyebrows. Your eyebrows are a little bit too far apart. Try to begin your eye brows a little bit closer. 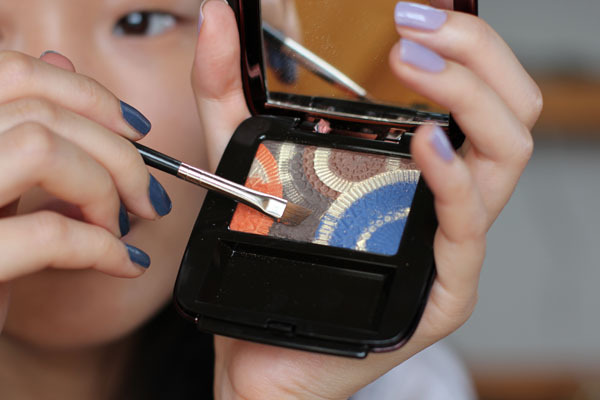 Also you should brush off excess powder from the beginning of the eyebrow, so they looks softer, otherwise they look too harsh and not so natural. I also agree that your eyebrow arch are exaggerated. Wow! You're quite plain without makeup but beautiful with it. Your tips are very helpful.